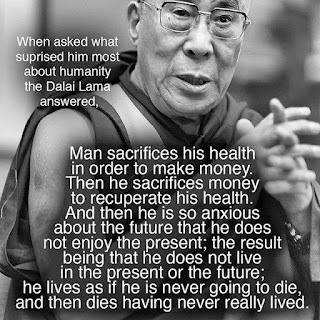 A profound and thought-provoking piece has been making the rounds on Facebook and other social media sites for a while now, BUT IT DID NOT ORIGINATE WITH THE DALAI LAMA. 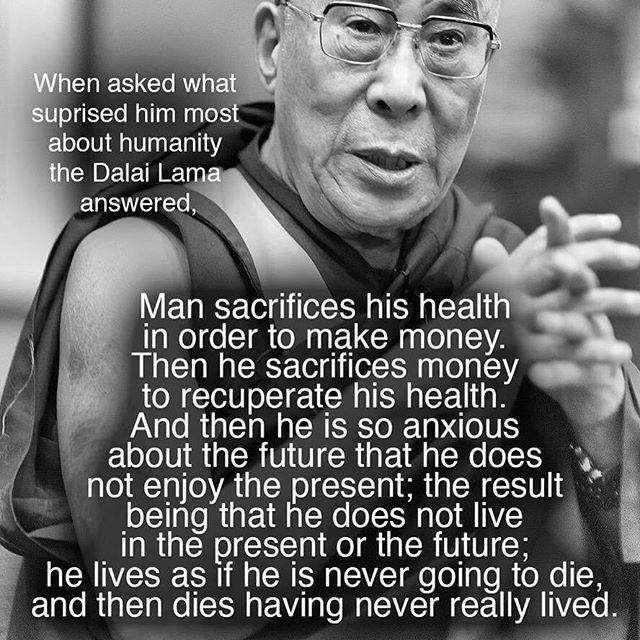 There is no denying that the Dalai Lama is an amazing, brilliant, and compassionate man. Still, I believe in giving credit to whom it is due, and it isn't due him. That it has been attributed to a man born in 1923 named John James (Jim) Brown -- pen name James J. Lachard -- and is said to be part of a piece he wrote, An Interview with God, is also not entirely confirmed, as it was never actually published by him. But at least there are some clues. The piece was allegedly found by a woman named Reata Strickland, who supposedly posted it in an online Alabama church bulletin in 2001, never claiming to be the writer. She did, though, have it published a year later, but with her name as editor. The piece ended up making its way around the internet, and as the internet is sadly filled with idiots who have nothing better to do with their time than (at their least) attribute actual quotes to people who had nothing to do with them, and at their finest, pass around miraculous "cures" involving cinnamon and honey for everything from ear infections to cancer, these words ended up superimposed on a photo of the Dalai Lama -- and if it's on the internet, then of course it must be true. Even worse, is that these hoaxters (big success stories!) rely on those who don't check facts to perpetuate these myths, and all I can say is that P.T. Barnum sure had it right. And if you were born in this country and still don't understand what I just said about P.T. Barnum, then you're truly a sad case of the stupids. In the early 2000s, three former colleagues (from the mid-80s) stopped speaking to me, because one of them -- a journalist and published author of children's books, mind you -- kept emailing hoaxes to a bunch of people to warn them of any number of things, and believe me, even then all it took was a relatively quick search to find out that these were hoaxes. (She also regularly included me in group emails to participate in prayer chains involving Jesus and saints, knowing very well that I'm Jewish.) The only reason I say "relatively" about doing a quick search is because of the load time back in the day of 64-bit processors, and a lot of people even still had 32s. Why did they all stop speaking to me? Because I responded (to all) that not only was the Klingerman Virus a hoax (if you receive an envelope with a small blue sponge in it, RUN! ), but that it didn't take much to find this out before forwarding it, and that a journalist -- of all people -- should know this. Oh, and please stop sending emails to me asking me to pray to Jesus, because I wouldn't send emails to you or any non-Jew requesting that you fast on Yom Kippur. Being shunned after that -- by people I truly loved and cared about, just because I pointed out that it was a hoax and not only easily checked out, but surprising that it wasn't especially from a journalist -- sent me into a spiral of depression that was probably the second worse I ever suffered. Even after I got help for it, the hurt remained. It took a long time before I became at peace with it; in fact, it took well into the Facebook years until I started seeing this kind of nonsense perpetuated on a daily basis, and thousands-fold. I still try to be diplomatic when pointing these things out to people I know who repost them, but I am starting to feel less compelled to even bother as time goes on (really, where did it ever get me, anyway?) Instead, I figured I may as well air my grievances on my own blog -- after a two-and-a-half year absence! -- despite the fact that Festivus is still a good month away. Here is the piece in its alleged entirety, or at least as best as I was able to find. Both line and paragraph breaks may not be true to the original. That is, if there is an actual, documented original somewhere out there. Whatever the case may be, I'm glad I came across this even in its abbreviated, erroneously-attributed form, because it led me to an even deeper truth than the truth of by whom it was authored, although the latter still is of great importance. about them, and likes them anyway. I sat there for a while enjoying the moment. I thanked God for this time and for all that He has done for me and my family. Then God replied, “Anytime. I’m here twenty-four hours a day. All you have to do is ask and I’ll answer.